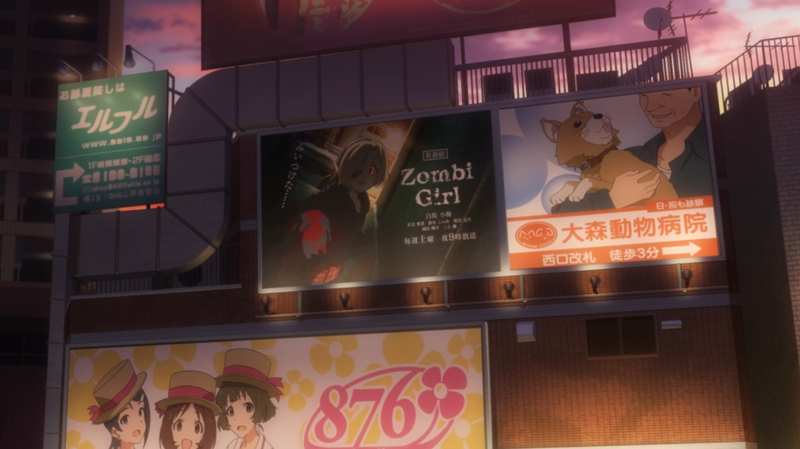 There’s not much going on in terms of story in the first episode of Cinderella Girls. 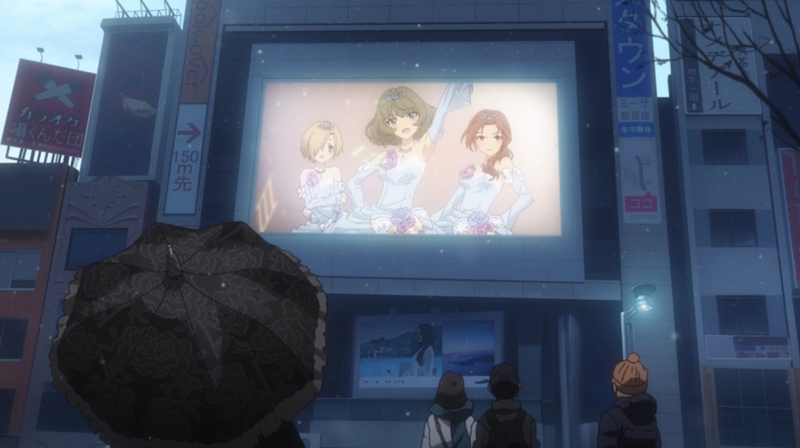 It’s what you would expect from an iDOLM@STER anime. You follow a somewhat novice producer (who is still unnamed) working to the 346 (Mishiro) Production (Aaaaw! They don’t work for Namco anymore!). His objective is to create a new idol unit for the “Cinderella Project” (name drop?). Mr. Producer goes around to recruit the girls with talents to be an a Pop Idol, and he manages to get two on the team on the first episode. Aaaand that’s pretty much it. So, what this anime has that it’s so much special? 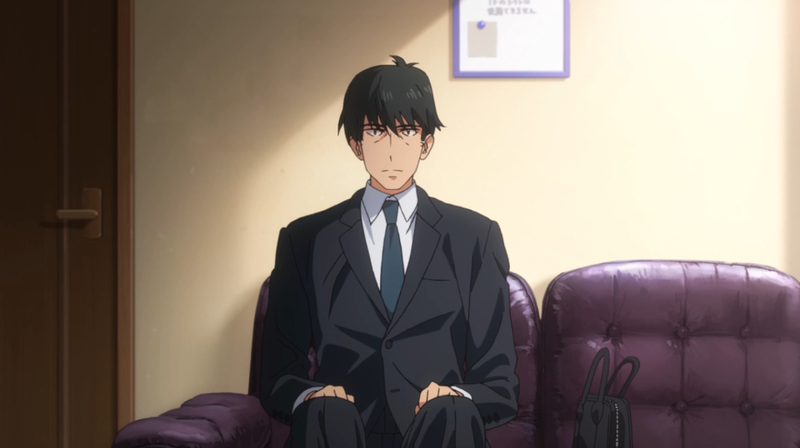 Well, Believe or not, the most special thing in a show about cute Pop Idols is: The Producer! (from now on, he will be called P-san). Look at this dude! He’s awesome! 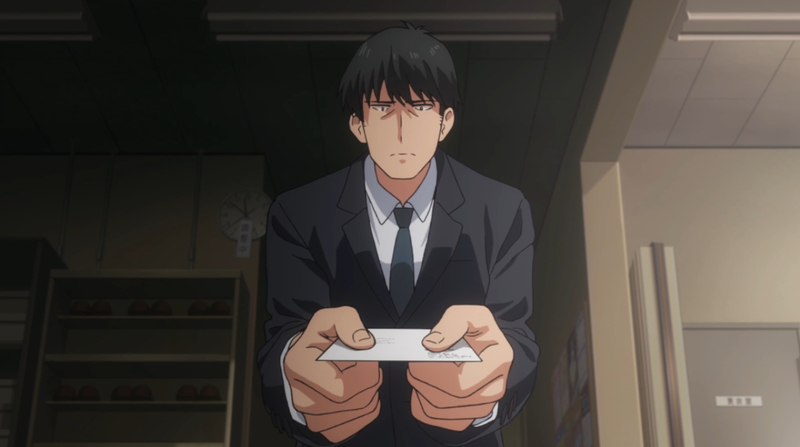 Sure, “the gigantic and scary guy who actually has a gentle heart” isn’t an uncommon Trope, but P-san manages to stand-out thanks to his own unique traits! For instance: This isn’t limited to his looks! his personality voice and everything else would make even the police scared…In fact, it does! Yes! 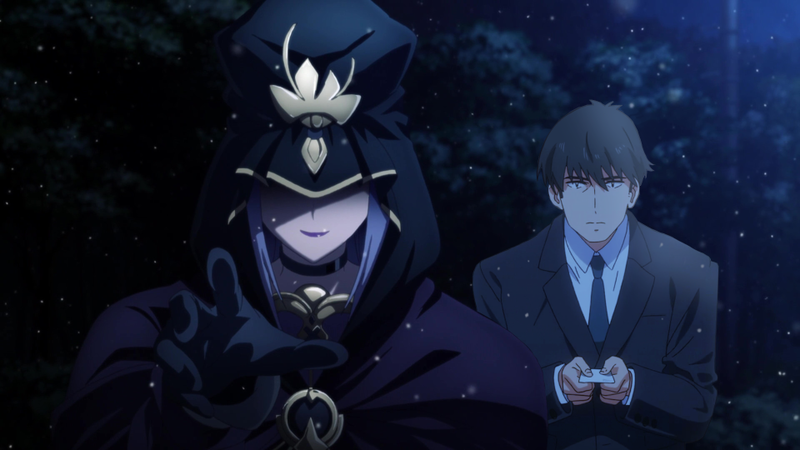 He sure looks a lot like Lurch from the Addams Family, but if you happen to be a TYPE-MOON fan, you will also notice some similarities with a certain Teacher/Master… Even though P-san is a newbie at the job, he has a strong composure that gives an aura of confidence on whatever he’s trying to do, even when he’s not certain if he’s doing the right thing. He’s a newbie after all, so he makes some mistakes but, different from most Harem protagonists, he doesn’t look pathetic when it happens! Since most male protagonists are really boring and weak in this kind of series, whenever the story focus on them, it gets really lame (this must be the reason for the popularity of those series that have an All-female cast without any men around). However, this show has win-win situation, because the anime will be always interesting to watch, be it focusing on the girls or on the protagonist. Actually, the most interesting parts where the ones featuring P-san, because he’s just amazing, and the internet agrees with me this time! He suddenly became really popular among fans, as his demeanor and lines have already become memes! 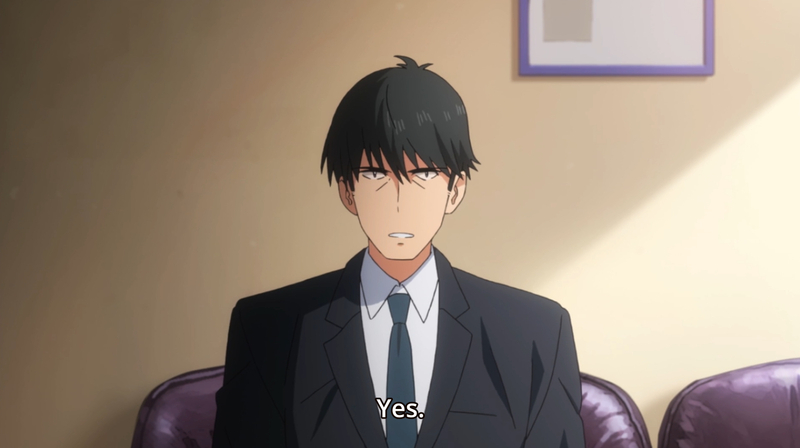 Like the way how he saying “YES” with a really manly voice: Or the way how his lack of experience makes him command the only girl in his team to do the same thing over-and-over again: I also love how he has a special answer to manipulate the girls he wants to recruit: And let’s not forget the way how he kindly offers his business card, which means he looks creepy to anyone else around him: But enough about cool and manly men. I’m sure everyone else will watch this anime for the cute girls. 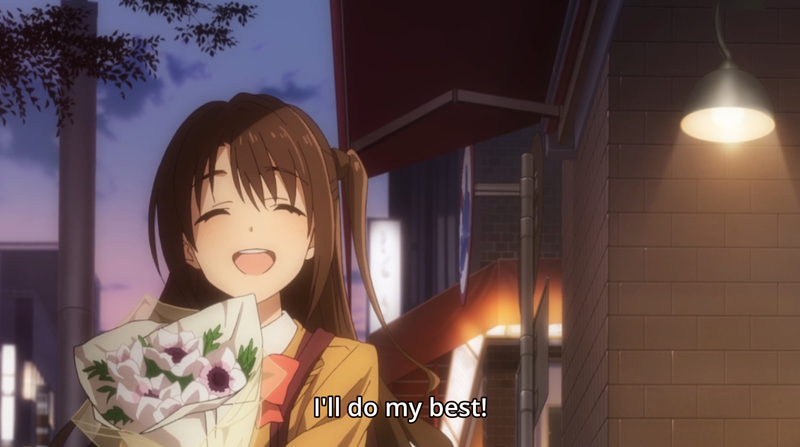 The first episode present two heroines joining the “Cinderella project”, the first one is Shimamura Uzuki. 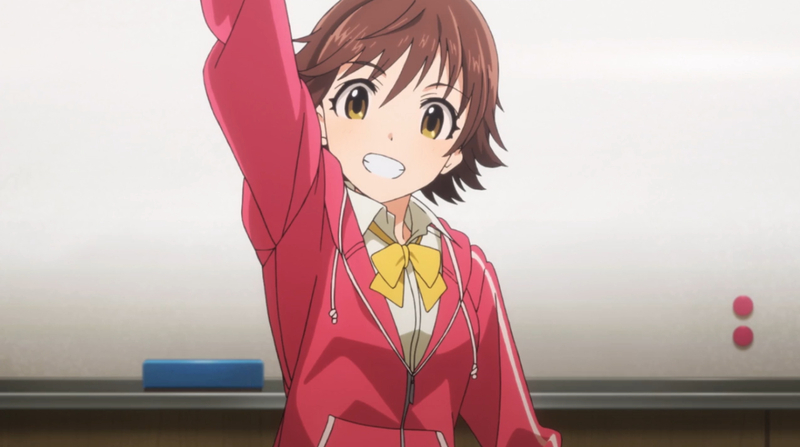 I don’t know much about her, but the episode depicts her as your usual happy and naïve heroine. She is “ok” for me. I guess she works as a main heroine. The next one is Shibuya Rin (or should I call her “Hanako-chan”). This one is more popular. Even I knew her before watching this anime. It seems she got a thing with dogs, and her fan-base uses this trait in the most unusual ways: But, who are the next girls to join the team? This was originally a social game, and those don’t get a lot of plot on them, and there was too many heroines, so it would be impossible to feature every fan-favorite idol. 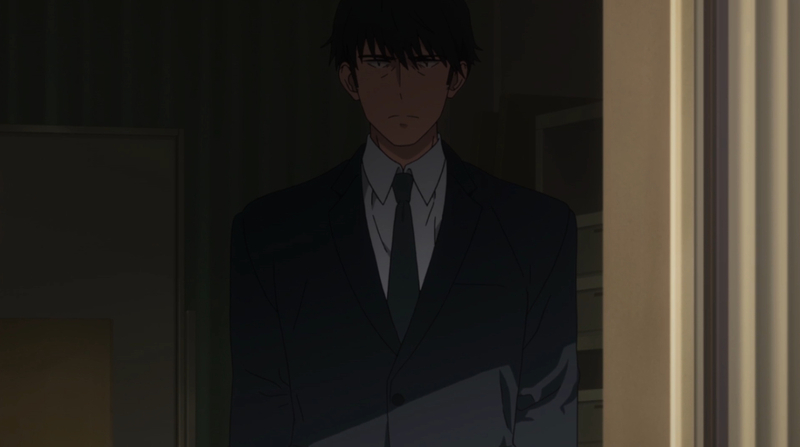 This means the official team is still a mystery and no one knows exactly what to expect from this anime (specially when the protagonist got such a poker face!). But, of course, there are already some speculations. The end of the episode shows Honda Mio during an audition, so she’s likely to become their next “nakama”. But how about the others? Presumably, many fan-favorites are already ruled out, since they are presented as Idols with a successful career, so they don’t have any reason to join this team of newbies. Maybe this anime will give a chance for the less popular girls to shine! That would be really bold of them! Anyway! I will keep watching this one mostly because of P-san! He made the show really fun and I’m looking forward to see his interactions with the rest of the cast! It’s really nice to see this kind of anime with a remarkable male protagonist, and I want more series to follow this example! This entry was posted in Anime and tagged A-1 Pictures, Anime, Bandai Namco, Review. Bookmark the permalink. As I said before. 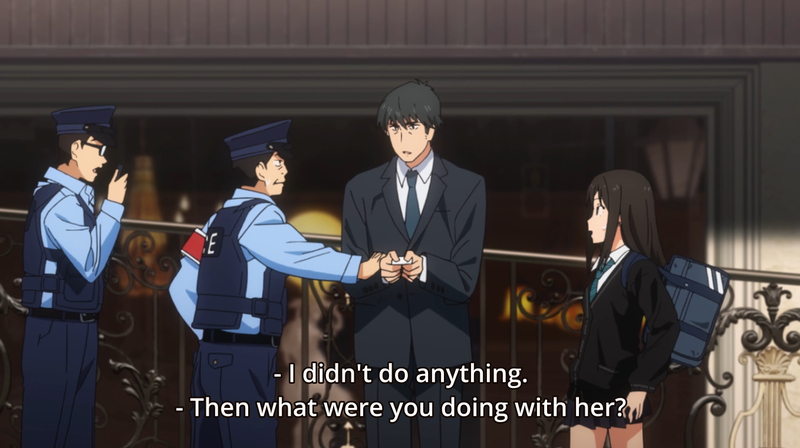 I admit it I started watching this show because all those Producer-san memes that suddenly appeared and no wonder he was the most interesting character in this episodes. Sure they can make all the other episodes focus on the girls but I know that at least the Producer could be a good back-up for the girls. I hope they add some more interesting girls as well. 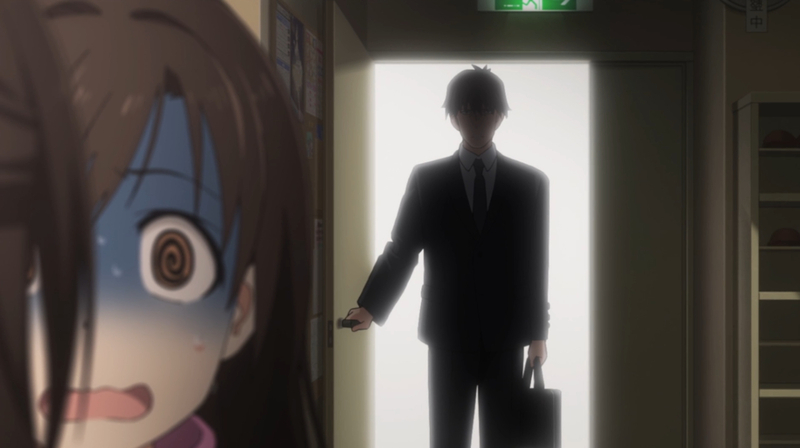 Rin is ok, but I don’t feel like Uzuki will be something else besides “the cute and naive girl”. and I hope to see a good chemistry between the best girls and the producer. Not only between girls. 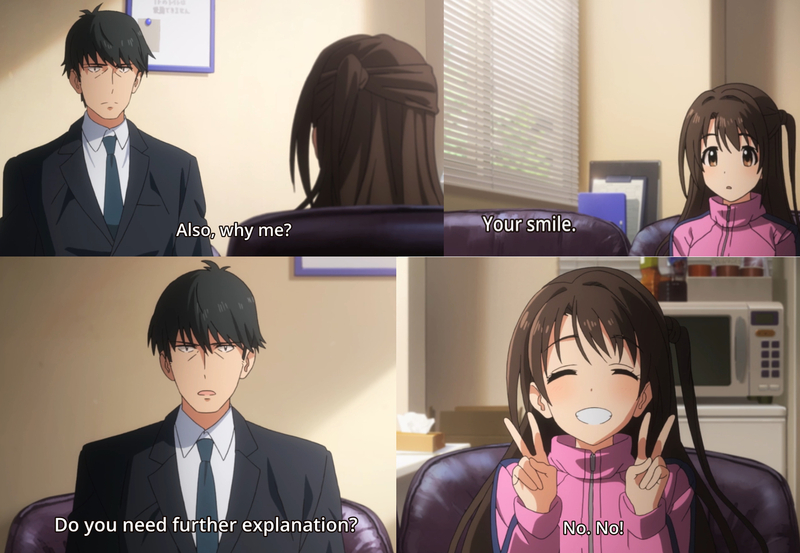 As for now, I think Rin is the one with the best chemistry with him, while Uzuki is just an easy target. 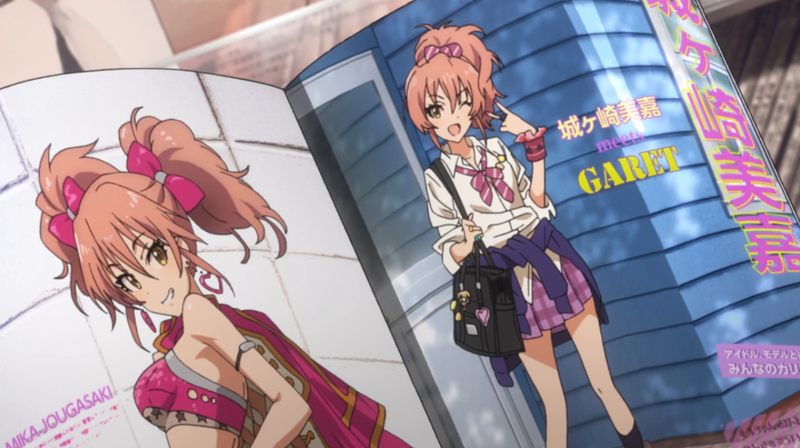 Some of the heroines in this Cinderella Girls spin-off got some pretty unique personalities, so I’m looking forward so see how the most weird ones would interact with this producer. I guess I’ll try this just for p-san. Thanks for the heads-up!